Benjamin was the son of Benjamin Sr. and his wife Mary Abbott Blanchard. 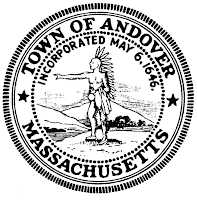 He was born in Andover but moved with his father to Hollis New Hampshire by 1743. He managed to survive the "throat distemper" of 1739 which claimed the lives of 4 of his siblings and was one of four children, out of 12, that survived to adulthood. On Oct 4, 1743 he married Elizabeth Holt in Andover. She was probably the daughter of Moses and Elizabeth Holt of Andover. She gave birth to a boy, Benjamin Jr., on July 2, 1744, she was dead by August and the baby in October. Benjamin remarried in December of the same year. His second wife, Keziah, was either healthier or had better luck. She gave birth to at least fifteen children. Their first child was born in 1745, a second Benjamin Jr. and the last in 1766, all were born in Hollis, New Hampshire. Keziah Blanchard was born Keziah Hastings in 1723. When I first started writing this blog post I thought I knew who her parents were, but while doing additional research I am beginning to think that I might have it wrong. I have previously written that her father was Thomas Hastings and mother Sarah White of Littleton, MA. They had a daughter born 7 July 1723 in Lexington, MA prior to their remove to Littleton. Littleton, MA is about 20 or so miles from Dunstable. I supposed that Benjamin could have traveled there on some business or such and met Keziah there. But in the reference books Keziah is said to be from Dunstable. Their marriage is recorded as 11 December 1744 Benjamin Blanchard and Keziah Hastings both of West Dunstable. In both "The History of the Town of Hollis" and "The History of the Town of Canterbury" Keziah is said to be from Dunstable, no mention of Littleton or any reference to her father is in these two book. 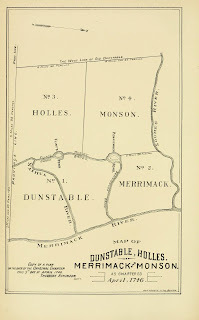 In the book "An Account of Some of the Early Settlers of West Dunstable, Monson and Hollis, New Hampshire" John Hastings and his wife Keziah Unknown lived in Dunstable with their four daughters, Elizabeth, Keziah, Mary and Sarah and their son William. All the girls married Hollis men. The book goes on to say that the four sisters had 42 children between them. This second candidate seems to be their more sensible choice for Keziah's parents. but at any rate Benjamin married Keziah. Anyone out there who can help with this? I sure need it! Benjamin Jr., his father and brothers were living in an area of Massachusetts that became known as West Dunstable. 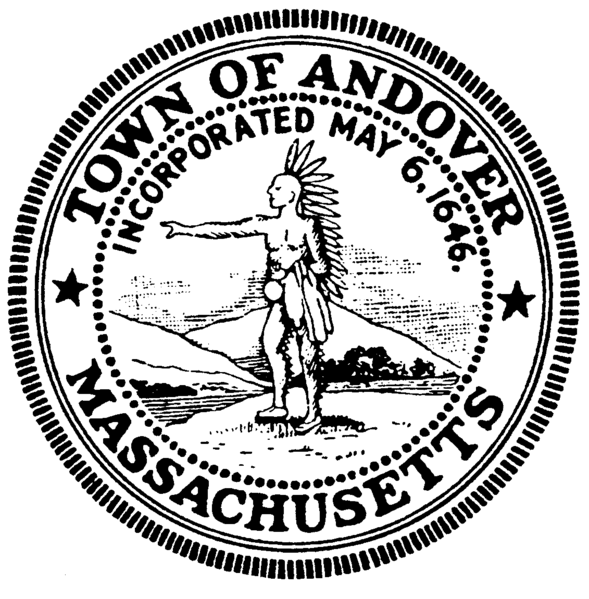 They and others living in this area had petitioned to become their own town, separate for Dunstable and were finally granted that right shortly before the English Government ended a lengthy border dispute between New Hampshire and Massachusetts. It is interesting to read the town records of West Dunstable and follow the changes as they came. 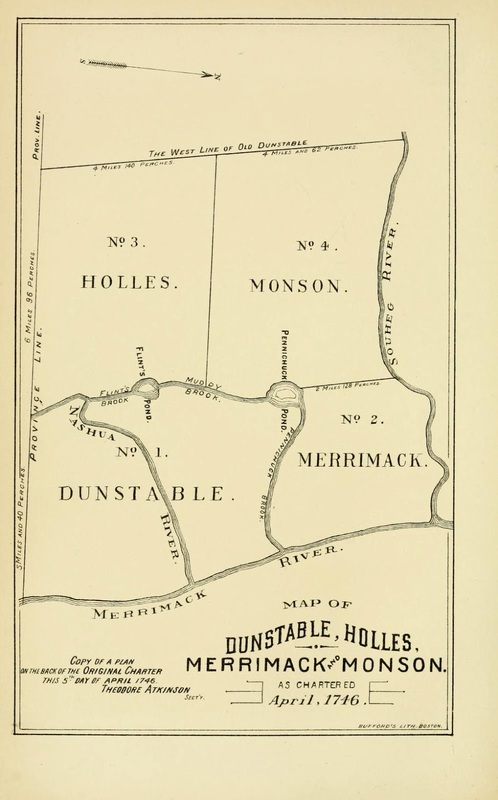 West Dunstable became Hollis, New Hampshire in 1746, it's charter granted by King George II. Benjamin and his father began appearing in the town records in 1743. While neither was chosen for the most prominent of positions they were obviously active in the running of the town. 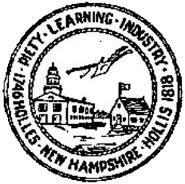 On November 29, 1769 Benjamin Jr. bought a farm and ferry in Canterbury, New Hampshire, which is about 50 odd miles due north of Hollis. 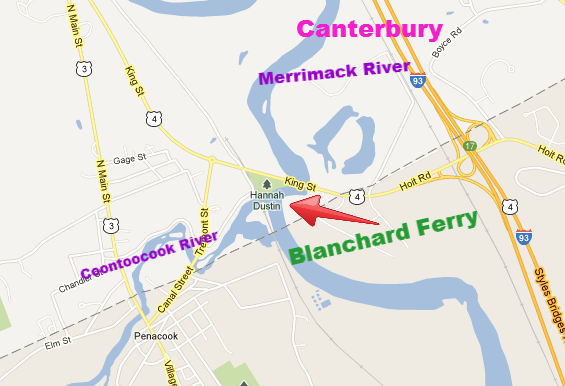 The ferry crossed the Merrimack and the Coontoocook Rivers, this was at the southwestern corner of Canterbury Township. The Blanchard family operated the ferry until the building of the Boscawen Bridge in 1804. When Benjamin Jr. arrived in 1769, Canterbury was already home to a Benjamin Blanchard. If Benjamin Sr. was still alive, and with the addition of Benjamin the 3rd, this meant that there were four Benjamin Blanchard's living in Canterbury, NH at the same time. This has obviously lead to some genealogical errors. The Benjamin too whom we are not related was in Canterbury very early in it's formation. I don't know the exact family dynamics but there were a Richard, Edward, Benjamin and James Blanchard living in Canterbury. In fact a Richard Blanchard was one of the original proprietors of the town in 1727. Beginning in 1744 Canterbury and other frontier towns in New Hampshire were being attacked by Indians, Richard Blanchard was scalped and died after an Indian attach on Canterbury. To defend themselves a fort was built at Canterbury and militia groups were formed A group of men under the leadership of Jerimiah Clough, "ranged" for months at time scouting for Indians around the Canterbury area. The Benjamin Blanchard who was part of this group was the Benjamin from Canterbury and not, as is found on some websites, our Benjamin Blanchard from Hollis. By the time our Blanchard family arrived in Canterbury the Indian troubles were mostly resolved. 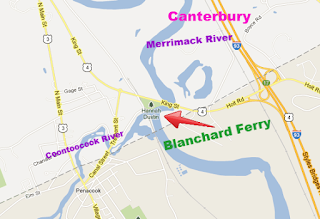 The other Blanchard family eventually left Canterbury to form a new town called Northfield. The name Blanchard appears in the records of almost every town meeting. Our Benjamin is known as Benjamin Jr. and his son Benjamin is Benjamin 3rd. The other Benjamin is frequently called Mr. Benjamin Blanchard. These distinctions make it fairly easy to identify which Benjamin is being referred to in the record. Benjamin Sr. is not mentioned in any record and he presumably died in Canterbury about 1770. The town records available on family search begin in the year 1774. That year Benjamin Jr., Benj. 3rd and Jonathan are all taxed. Benjamin remained in the records until the year 1790. He held various town jobs, was moderator at town meetings, his son Jonathan was often given the job of hogreeve. Benj. 3rd disappears from the town records in 1780. Keziah Hastings Blanchard died sometime between 1766, the year her last child was born, and 1778, when Benjamin married for the third time. She did not die in Peacham, Vermont as many internet tree claim. Benjamin's third wife was Sarah Burbank, daughter of Moses Burbank of Boscawen. After Benjamin's death she married Obadiah Mooney of Canterbury. She and Benjamin had four children together. Benjamin died on 7 March 1791. There is no grave or marker for him.